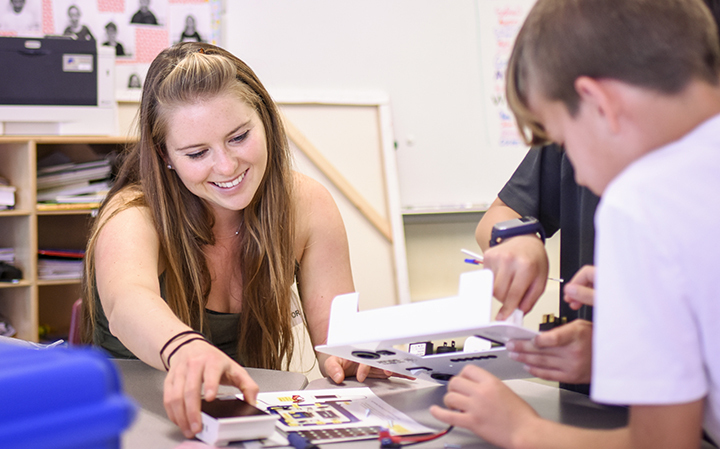 An interdisciplinary team of Cal Poly students brought the power of the sun in a suitcase to a local elementary and high school. The school children learned about the impact of solar energy by building a small solar-powered system - and then figuring out how to improve it. 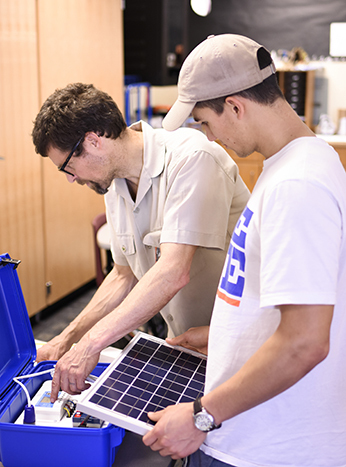 The Cal Poly students provided a kit, roughly the size of a common suitcase, that contains everything necessary to provide 24-hour solar electricity: a battery, charge controller, hanging lights, and a phone charger. The non-profit We Care Solar, which provided the We Share Solar Suitcase kits, distributes the 30-pound units to remote medical clinics serving populations without basic infrastructure. They also give some kits to U.S. schools to help spread the word about solar power. The Cal Poly team wanted to take the project one step further. "We decided to spread the word locally about solar energy as well as put together a rough blueprint for a less expensive solar suitcase," said team member Jeremiah Schoenfeldt. The student team - Schoenfeldt, a fourth-year kinesiology student; Olivia Woods, a fourth-year kinesiology student; and Jojo Fleischman, a third-year environmental engineering student - challenged students in a local elementary and high school to understand the basic components of the device and build a similar model at a much lower cost per unit. The team found that high school and elementary school students were more than capable of understanding the basic principles of solar electric systems. Younger and older students successfully sourced more affordable materials to create a similar version of the solar suitcase at a significantly reduced price. The idea for creating a more affordable suitcase followed the theme of physics Professor Pete Schwartz's Appropriate Technology for the World's People course. The class focuses on what types of technologies are accessible in the developing world. During projects such as the Solar Suitcase, students learn the important skill of collaborating on interdisciplinary teams. "As a group with different majors, we had to find common ground and common interests, so the challenge was to find a goal that was important to all of us," said Jeremiah Schoenfeldt. Schwartz requires interdisciplinary groups in his class so that students learn to use each others' strengths to achieve a common goal. "Some of the most interesting teams I've seen had students from vastly different backgrounds and interests. You might have aspiring engineers, scientists and art students all mixed together. That creates unique challenges, but learning to work together gives students the skills they need to collaborate in the real world," said Schwartz.